With the help from MAHB.Standford.edu, the traditional Lingnan Style Guo hua, an art form expressing the human appreciation of nature since its creation, is now given an opportunity to grow and develop. 1 With the help from MAHB.Standford.edu, the traditional Lingnan Style Guo hua, an art form expressing the human appreciation of nature since its creation, is now given an opportunity to grow and develop. Anita Yan Wong, an Art Professor and a Specialist in Modern and Traditional Chinese art, is a long time pupil of 辛鵬九– a World-renowned Lingnan style master (嶺南畫派) and first pupils of Chao Shao An. Anita is the 4th generations of Lingnan masters, she specializes in both traditional and modern arts. Her goal is to preserve and push the limit of Lingnan Guo hua with her knowledge in Art and Design, her background in both modern and traditional eastern and western Arts and the help of Scientist and Socialist. With the help from MAHB.Standford.edu, the traditional Lingnan Style Guo hua, an art form expressing the human appreciation of nature since its creation, is now given an opportunity to grow and develop– the traditional art form will once again question the modern minds, it will once again serve as a voice and an instrument for Nature with an updated style, scientific and social meanings. 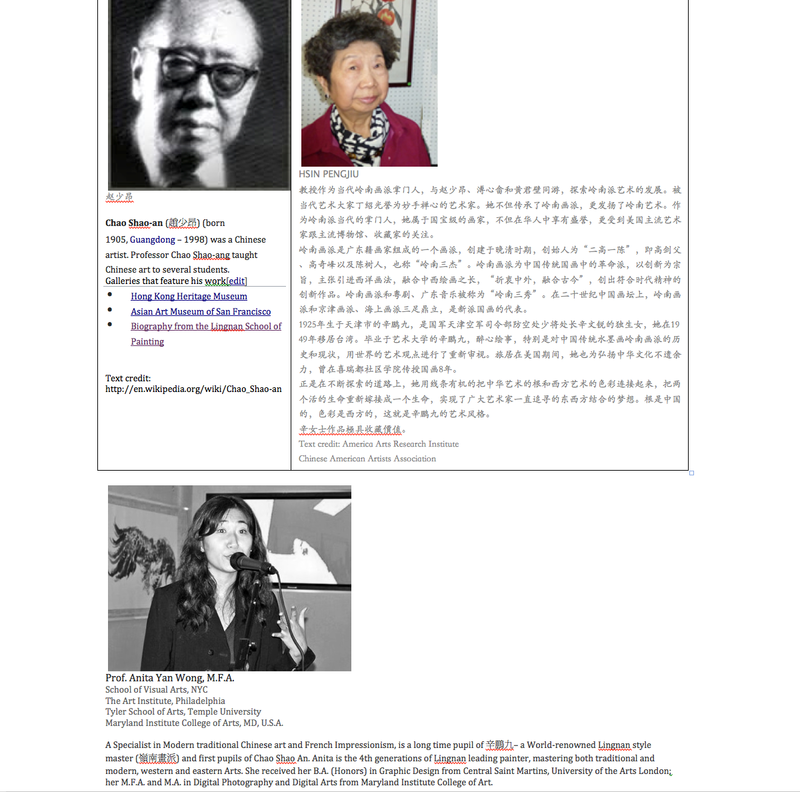 Hong Kong American Artist archived under AAAC, N.Y.C. Maryland Institute College of Arts, MD, U.S.A.
My current works have been dealing with preservation of Nature and the ancient art form that honors it – “Guo hua”(rice paper painting), specifically the fragile and rare art of traditional Lingnan Guo hua. Lingnan Guo hua, once considered as the most lively and contemporary of all Chinese Guo hua is now a rare art and considered by some critics as a dying art form. With few pupils of practice, the style and message of the art form has not been pushed to its potential. It did not catch up with time as the Art World quickly evolved in the digital art age. Did the the traditional art form of Gou Hua, along with Calligraphy once honored and practiced by almost all households in China, lost its voice as cities raises and as most sees it as a tradition rather than a voice or a messenger from nature in the Modern World? Is the core meaning of the ancient art form that once honored nature being preserved and kept in the fast economy driven digital age? Like another influential 19th century Art movement – Impressionist, the success of Lingnan Guo hua (traditional Guo hua that opened its door to Western and Japanese influence during World War II) in the late 19th and early 20th century played a key role in Modern Chinese painting; its beauty (described by many critic at the time as a competitor with the real beauty in nature) that captivated and inspired many should not be forgotten. Both Nature and the ancient art form that honors it is given light, a second chance and a voice in this project. “A broken butterfly wing, a bunch of fallen leaves on the path way, a cicadas shell on a tree, some strangely grown twigs and pressed flower bookmarks from my childhood friend: I find these preserved objects beautiful and precious. I have preserved these strange finds from nature under glass with backgrounds of “Guo hua”, rice paper paintings, one of the oldest art form that honors Nature. They are given a second life and are frozen in time with new meanings under the glass, they tell stories of their existence and lives. Rice paper painting along with Calligraphy was once a common practice among all Chinese is seen by some as a dying art form. As a Chinese American artist, I want to preserve it, cherish it and bring it to life with new ideas and creative thinkings. The title “Preserved” contains the meaning of preserving Nature as well as the traditional art form of “Guo hua”, both fragile but beautiful, both need to be protected and preserved. 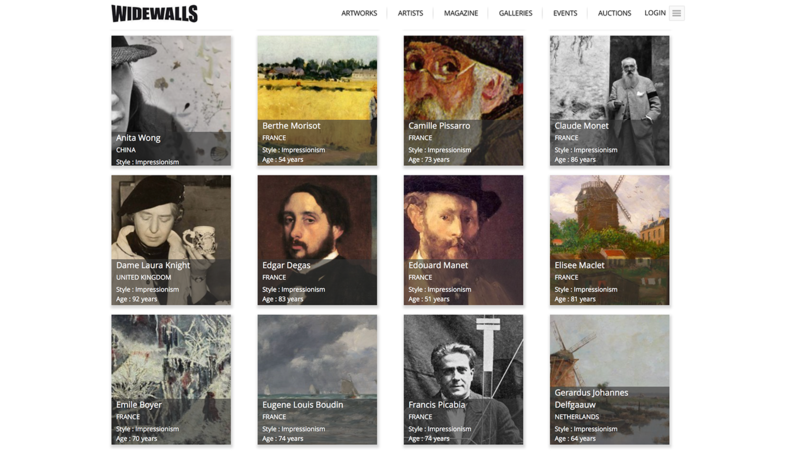 Two art movements blossomed in the 19th century, they are separated by oceans away, one in China, the other in France. They are known by us as Lingnan style Guo hua and the Impressionist. ” I want to have an open heart but not change the style for the wrong reasons, not for some trends. It must flow, it must change with reasons and with its core meanings. I don’t know what it would change into, I cannot see its ending but I believe in it and know I am dedicated to this in my life time. Does our relationship with nature different than it used to be? If the medium could speak, how would its subject matter change with time? As we look at the traditional Lingnan style Guo hua in the past, it is often close ups of birds, animals, flowers and beauty in nature. It never complains, everything is with harmony and everything is perfect. If nature is crying, the medium that honors nature must be weeping with it. What is our relationship with nature? How does the subject matters change in 2017 and jump out of its box/limitation since its creation. What is the real message it tries to deliver to us? The chaos and movement in nature makes the subject matter interesting. My new paintings are inspired by the chaos, the movements and its voice. “Swan” by Anita Yan Wong, the body of the swan becomes a form in this semi abstract painting, the subject matter “bird” is no longer as important as its beautiful form, viewers are asked to appreciate the beautiful form of the swan rather than the bird itself. We used to live among Nature, what is our relationship now with Mother Nature? “Fallen angels” is a painting opposite to the traditional composition in Chinese landscape painting where small figurative are surrounded by Nature. Characteristics of mushroom, a metaphor of how we spread as a society. Many once thought that mushrooms spread by passively dropping their spores, after which the reproductive packets would hopefully get picked up by a gust of wind, and carried thither and yon. But new research shows mushrooms take a more active role in spreading their seed: They “make wind” to carry their spores about, said UCLA researcher Marcus Roper. Painting inspired by “Green man”, a male counterpart – or son or lover or guardian – to Gaia or the Earth Mother. The most common and perhaps obvious interpretation of the Green Man is that of a pagan nature spirit, a symbol of man’s reliance on and union with nature, a symbol of the underlying life-force, and of the renewed cycle of growth each spring. In this respect, it seems likely that he has evolved from older nature deities such as the Celtic Cernunnos and the Greek Pan and Dionysus. Some have gone so far as to make the argument that the Green Man represents a male counterpart – or son or lover or guardian – to Gaia (or the Earth Mother, or Great Goddess), a figure which has appeared throughout history in almost all cultures. In the 16th Century Cathedral at St-Bertrand de Comminges in southern France, there is even an example of a representation of a winged Earth Mother apparently giving birth to a smiling Green Man. The body of the bird becomes a symbol, a character that indicates Calligraphy and language.